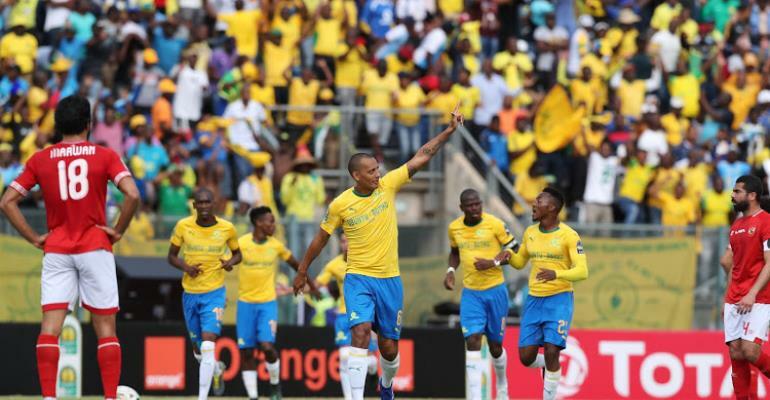 Mamelodi Sundowns thumped Al Ahly 5-0 in the CAF Champions League quarterfinal, first-leg match at the Lucas Moripe Stadium in Tshwane on Saturday afternoon. The South African champions will carry a 5-0 aggregate lead against the Egyptian giants into next weekend second-leg clash in Egypt. Sundowns continued their dominance following the halftime break and they were awarded a penalty after Maboe was fouled by El Shenawy. The Brazilians continued to attack after extending their lead and Sirino, who had a good first half, got the goal he had been looking for. Moroccan marksman Walid Azarou was introduced by Al Ahly in the closing stages as the record eight-time Champions League winners searched for an away goal. Speedy fullback Thapelo Morena set up Mahlambi, who sealed Sundowns' emphatic 5-0 victory in the 82nd minute following a counter-attack. Al Ahly: El Shenawy, Ahmed Fathy, Ayman Ashraf, Saad Samir (Ibrahim 20'), Maaloul, Hany (Maher 36'), Al Sulaya, Sobhi, Karim Nedved, Mohsen, Ajayi (Azarou 69').